sacrilegious silliness this side of you-know-where. 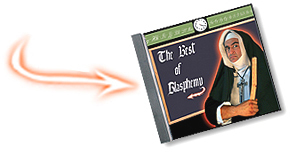 "The Best of Blasphemy is irreverent soul food for skeptics and wise-asses." "It's a little dicey, but I really liked Sister Josephine." "Religion without Humor Is Blasphemy"